With the cooperation between Somali National Olympic committee and the ministry to boost sports among youth, high level officials from both institutions today visited some key sporting facilities in the capital Mogadishu on Wednesday. The visited facilities include: the compound of the ministry of sport, long tennis court, basketball stadium, table tennis stadium, compounds that used to house national sporting federations and other sites. 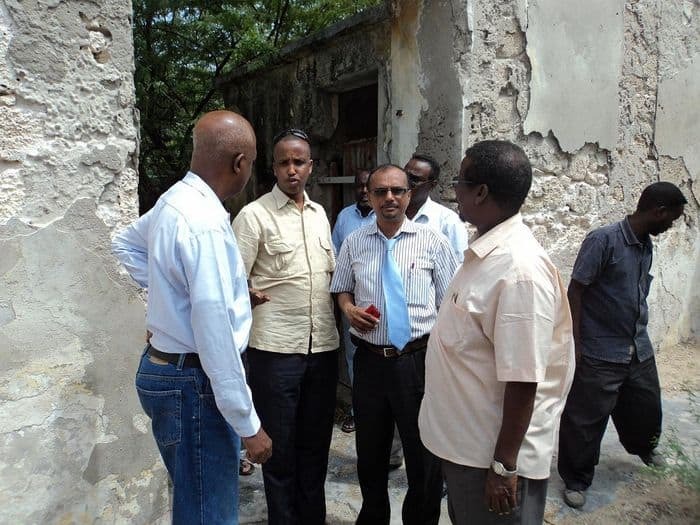 According to Somali NOC president Duran Ahmed Farah, the joint visit was mainly intended to assess the general situations of the country’s devastated facilities and how Somali NOC and the ministry of sport can cooperate on the rebuilding of the destroyed facilities. 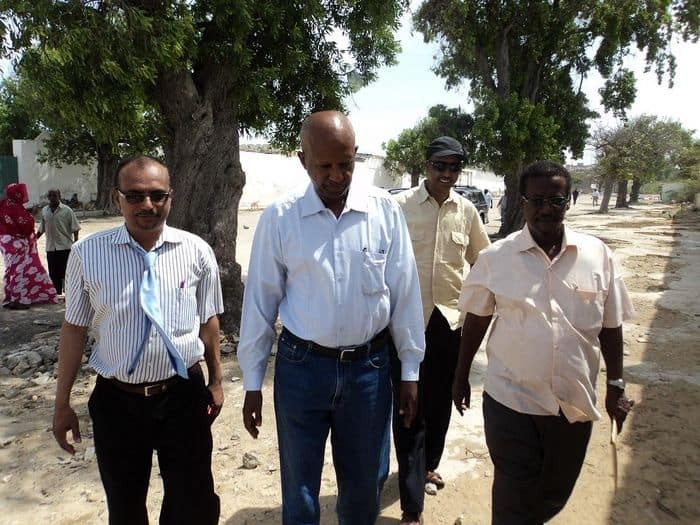 Somali National Olympic committee walk to a sporting facility in Mogadishu. At the end of the visit, Somali NOC and the ministry of sport officials held a joint press conference during which the minister Mahmoud Jirde Hussein announced that a joint committee from both sides will be formed to seek for local and international support for the construction of the country’s destroyed sports facilities. Director General for Somali youth and sports ministry Aweys Sheik Hadaad told the media that the joint visit was a clear signal for the better relations between the ministry of sport and Somali National Olympic committee. Somali National Olympic committee visit a sporting facility in Mogadishu. 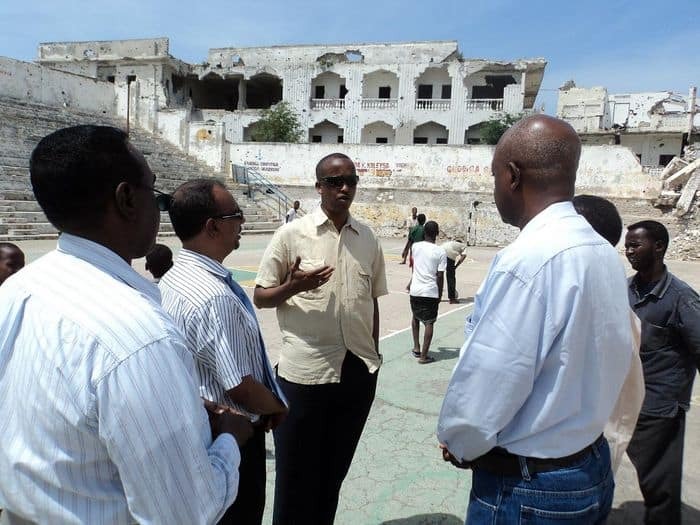 President of Somali National Olympic committee Duran Ahmed Farah added that some key sporting facilities were visited and both Somali NOC and the ministry of sport are committed to renovate and repair devastated sports facilities. “Taking advantage from the current stability in the country, we have to rebuild our sporting facilities with the help from Somalis and the outside world,” the Somali NOC president noted. For his part, the minister for youth and sports Mahmoud Jirde Hussein stated that he was very happy with the bilateral relationship between his ministry and Somali National Olympic committee. “If there were misunderstandings between the ministry and Somali NOC before, now we pledge to work together on the development of Somali sports and we will form a joint committee who will work on the rebuilding of our destroyed facilities,” he said. The newly-appointed minister also stated that Somali National Olympic committee and its affiliated federations are praise worthy for the role they have played in the promotion of sports in the war-ravaged country for the past two decades. Since the appointment of the minister in mid April this year, there have been growing cooperations between the ministry of sport and the national Olympic committee of Somalia.